We left Miami Beach with quite a bit of planned work undone, including repairs, upgrades, and renovations. Thus we are carrying around a pretty lengthy punch list of items we hope to get taken care of along the way during short stops in various places, just as we did with the tires in Apopka, FL And as one might expect when you take a 52 year old vehicle that has not seen much recent use on a multi-thousand mile journey, new issues crop up. We have had some difficulty getting recommendations for reliable shops that are marginally on our route and are comfortable working on our old bus, or at least on any engine and transmission related issues. 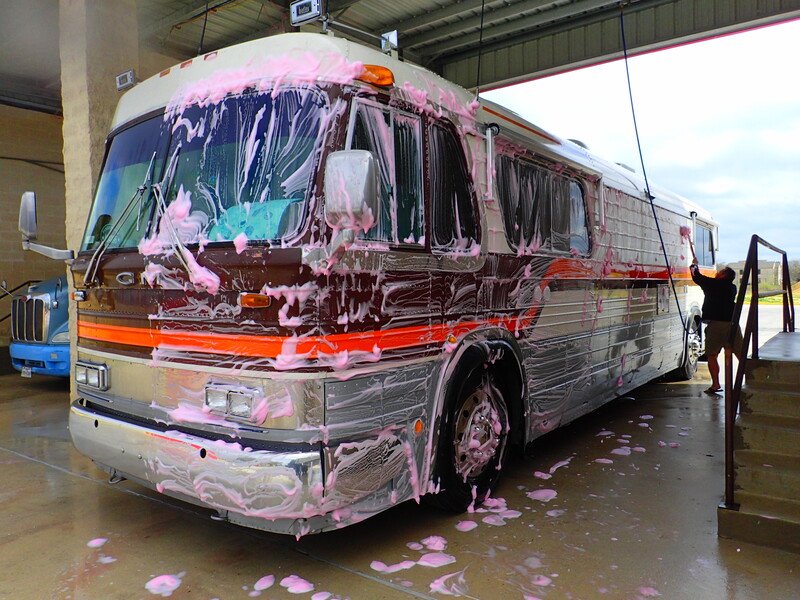 Fortunately the RV blogger network can usually provide guidance if not outright answers, and last month Eric and Brittany from RVWanderlust posted their immense satisfaction with work they had done at Iron Horse RV in San Antonio. A new development, a slow dieself fuel leak pointed out last month by the mechanics that changed our tires, and that I feared was actually seeping from a weakened weld or seam on the tank itself. Air leak on a braided metal compressed air hose near the transmission, very slow, but needed to be addressed. Replace all the reinforced rubber hinges on the under bus storage compartments, one of which had already completely seperated, and the others were not that far from it. To our relief our assigned mechanic found the diesel fuel leak right away, and it was merely the rubber portion of the fuel line and connection point, not the tank itself. He also found the air leak and got a new one manufactured by the next day. The vanity top install took a while since it involved removal of the old stuff, removal of door trim to get the new vanity into the bathroom, installation all new plumbing fixtures under the vanity, and caulking the edges. They progressed faster than expected and were able to move to my number four request, knocking out all but two of the storage door hinges using the special hinge material I had found in the parts bins that came with the bus. To make this an even better stop, Iron Horse had an open spot in their on-site RV hook up lot, so we were able to stay with power, water, cable TV, and limited wifi for no extra charge, offsetting the repair costs somewhat. We stayed two nights, and Carlos finished up the last of the door hinges first thing Friday morning, allowing us to get on our way with a full day ahead of us. All in all I can say this was a great experience, especially how fast Iron Horse was able to get us in and out despite their full garage. It was a bonus to meet Eric as well. We headed over to Steward & Stevenson but unsurprisingly they could not fit us in on a Friday, so we will head on down the road and pick up work earlier in the week at a shop in El Paso or maybe Albuquerque. We celebrated a succesful stop by giving the Big Kahuna a bath at a truck wash center. It’s so amazing that you are able to do so much, driving that huge iron horse! Did you say 57 years old?! It’s amazing that you can handle all of the work (mostlu Jack, I’ll bet!) and care required with admirable equanimity – and even manage to keep having fun! I’m loving this trip! Hope you are, too. Sending love and soany blessings along the way!